Energy consumption underpins all aspects of modern society. Recent supply disruptions and price increases have brought attention to a commodity which is often taken for granted. Our energy system is more complex and diverse now than at any previous time in human history. The energy sector in Australia makes a substantial contribution to the nation’s gross domestic product, export earnings, and employment. A secure supply of affordable, reliable and environmentally sustainable energy is essential to Australia’s future economic growth and prosperity. Australia has an abundance and diversity of energy resources that supports domestic consumption and substantial fossil fuel energy exports around the world. 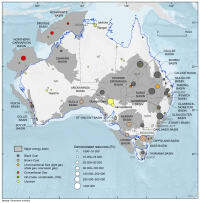 Australia continues to have the world’s largest known economic uranium resources, the fourth largest coal (black and brown) resources and substantial conventional and unconventional gas resources (Table 1 and Figure 1). There is good potential for further growth of the non-renewable resource base through new discoveries. Identified resources of crude oil, condensate and liquefied petroleum gas are more limited and Australia is increasingly reliant on imports for transport fuels. 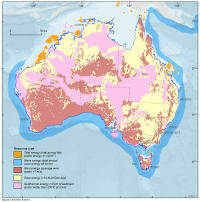 Australia also has plentiful and widely distributed wind, solar, geothermal, wave and tidal resources (Figure 2). Hydro energy resources have been extensively developed, and wind, solar and bioenergy resources are increasingly being exploited for electricity generation. Although adoption of offset technologies (e.g. geothermal heat pumps, solar hot water) has gradually increased, the other renewable energy resources remain largely untapped for electricity generation (Table 2). The utilisation of renewable energy will continue to increase significantly to around 2020, reflecting government policies (e.g. the Renewable Energy Target) and falling installation costs. Advances in renewable energy generation and storage technologies and better mapping of resource potential will be important for continued uptake, and so will technologies and policies for grid integration. Domestic and international demand for Australia’s energy resources continues to rise, although the energy mix is changing. However, the energy intensity of the Australian economy is expected to continue to fall over the next few decades through energy efficiency gains and a changing industrial landscape. Increasing use of renewable energy sources will require energy infrastructure to become more flexible and potentially decentralised over time. As this transition occurs, understanding Australia’s energy resources and the factors likely to affect their development has never been more important. Geoscience Australia and the Economics Branch of the Department of the Environment and Energy, with support from the Australian Renewable Energy Agency, have produced this integrated scientific and economic assessment of Australia’s non-renewable and renewable energy resources. This publication provides a snapshot in time to enable a comparison across energy resources. This release of the Australian Energy Resource Assessment (AERA) is the first to be published in an internet-delivered format. This new format offers enhanced functionality (including data download) and easier navigation. This transition from print to digital publication is part of the ongoing evolution of AERA to ensure it continues to provide relevant information to stakeholders. a. Includes Economic Demonstrated Resources and Subeconomic Demonstrated Resources; b. Includes reserves; c. Includes reserves and contingent resources; d. Recoverable coal resources; e. Recoverable resources at <US$130/kg; f. A conversion into energy content equivalent for thorium was not available at the time of publication; g. Excludes thorium resources. a. Large-scale electricity generation capacity. b. Large-scale electricity generation capacity (small-scale rooftop solar installation generation capacity). c. Includes bio generation capacity from bagasse, landfill gas and sewage, forest residues and other sources.